Whether you're too tired, too busy, too lazy, or just apathetic, there's a good chance that health isn't top of mind when you're thinking of your first meal of the day. No matter how much you'd like to believe otherwise, your Count Chocula cereal doesn't give you the kind of benefits real chocolate delivers. Luckily for you, there are plenty of healthy, easy breakfasts you can add to your rotation. Like any of these options -- they're less than 300 calories, and should take you no more than 15 minutes to make. To keep things stupid simple, your breakfast should have a healthy balance of carbs, proteins, and healthy fats. But you can’t just eat any types of these macronutrients -- there are rules here, people. Your fats need to be of the healthy variety, like monounsaturated and polyunsaturated fats. You'll find these in avocados, nuts, and olive oil. Back away from the trans and saturated fats found in processed and frozen foods, which should curtail your Pop-Tart addiction. Grab a slice of freshly toasted bread (seriously, don't mess this up and let your toast sit too long or it will become as hard as a crouton). Take ¼ of an avocado and smash it all over the toast. Add salt, pepper, and a drizzle of olive oil. 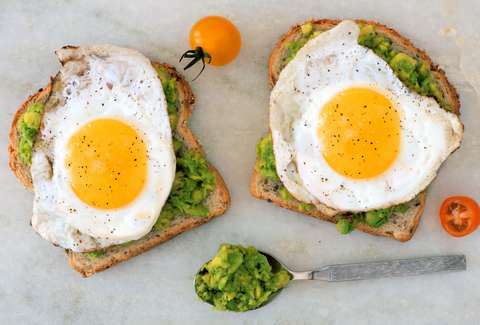 Next, cook one sunny side-up egg and add it to the top of your avocado toast. Hey, you're done. This easy breakfast combines protein, carbs, and healthy fats all for a whopping 257 calories, assuming you're using a piece of rye bread. Seriously, aside from people who can't handle dairy, who doesn't love quesadillas? They make every day better. So imagine the rainbow road you'll be cruising on when you start your day with one. Waffles are another I-could-eat-every-day kind of food, but making them is too much work. The health-food explosion has made it pretty easy to find a decent frozen option (Van's and Nature's Path make good versions). On your extra-lazy and sleep-deprived days, this recipe will satisfy hunger, doesn't involve too much work, and tastes closer to homemade than those radioactive-colored round ones. So toast two waffles while you’re getting in a morning scratch and stretch. Throw ¼ cup of blueberries and a small handful of roughly chopped almonds on top, or fold them up in a waffle taco. Sprinkle a dash of cinnamon on top for an extra flavor boost. Marvel at your creation that clocks in just shy of 300 calories. When it’s too damn hot for waffles and you literally have less than five minutes to run out the door, you’ll have just enough time to hunt down everything you need for a pared-down (i.e., healthy!) Greek yogurt parfait on the go. 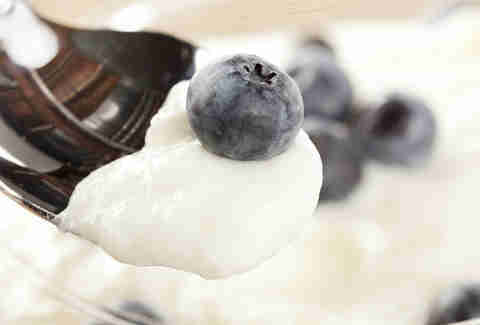 First, start with a plain 5oz Greek yogurt container. Next, grab a plastic zip-top bag to stuff with goodies; you can stick with the blueberries and almonds from your waffle breakfast (145 calories with at least 18g of protein thanks to the Greek yogurt and almonds), or customize your mix-ins according to your tastes. If this very low-cal recipe leaves the monster in your stomach groaning for more, double the blueberries and almonds in the recipe, which will bring you to about 215 calories. And there go all of your excuses for skipping breakfast. If you follow these recipes, your day will start off right and you'll have boundless energy for all your happy hour and late-night activities. Devan Ciccarelli is a writer and marketing specialist who can’t decide if she’s having a quesadilla or waffles for breakfast. Help her decide by following her on Twitter: @DevanCiccarelli.